For the effective mainstraming of gender in IWRM, capacity needs to be built. 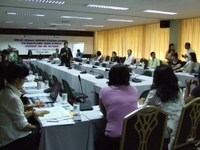 GWA is commited to developing training material targeted to the need of particular professional and sectoral groups. Furthermore Training of Trainer courses and national level courses on gender and IWRM are organised. Here information about capacity building programmes as well as reports of workshops and training sessions are displayed. For training materials please visit the section "Library" of this website. Gender Mainstreaming in UN-Habitat "Water for Latin American and Caribbean Cities"